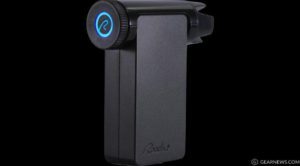 The Roadie 2 tuner is the second tuner created in the Roadie Tuner lineup and surpasses every benefit that the Original Roadie Tuner had. It is what you would call a Standalone Automatic Tuner. Basically it is a device that will make tuning your instrument extremely easy and more accurate than the human ear ever could. It is a small rectangular box that has an LED screen on top of it, a “Dial” with a button in it on one side, and a “Slotted Dial” on the other side of the device. There is also a little light under the Slotted Dial that shines white when the device is on. 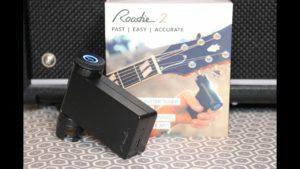 The Roadie 2 is pretty compact, accurate, and is a game changer for sure. 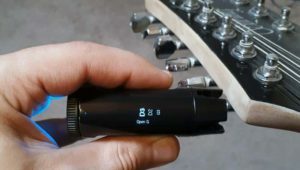 With regular tuners, you have to clip them on, buy batteries, and/or be absolutely silent when tuning. Not with this guy! 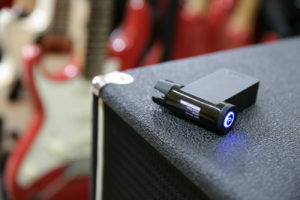 Uses vibrations from your instrument to more accurately tune it, instead of relying on sound and making sure that there is no external audio interference from other things to get the job done. You can tune-up just about anywhere and accurately, regardless of how noisy it is around you! Press and hold the button (inside the Dial) for a couple of seconds to Turn the Device On. Looking at the little screen, scroll through to find what type of instrument you are wanting to tune. After finding your instrument, press the same button again to select it. This brings you to what type of tuning you’re wanting to use. Again, find the one you like and select it by pressing the button. Grab the device with one hand and put the “Slotted Dial” on your lowest (thickest) string’s tuning peg. Hit that string a couple of times and you will see the Slotted Dial start to turn – loosening or tightening the string. Once that string is perfectly in tune, the Dial will stop turning, it will light up green, and the device will make a “happy” beeping sound. (If you accidently hit the dial and it changes to a string you’re not tuning at the moment, or if you accidentally put it on the wrong tuning peg, it will shine red and make a “not so happy” sound.) Once that string is in tune, put the device on the next string and do the same thing. Keep going until you have done this with all of the strings. NOTE: The device will automatically highlight the next string in line as well. To turn the device off, simply press and hold the button for a few seconds and it will shut down – After doing all of that, your device should and will be perfectly in tune so you’ll be ready to rock. After reading many reviews and watching videos on the Roadie 2, I decided to purchase one to try it out for myself. I have to say, that it was one of the best music purchases I have ever made. 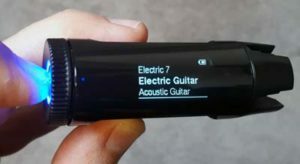 Not only does it tune my guitar quickly and extremely accurately, the device is very durable, holds a charge for a VERY long time, and is Blu-tooth compatible – allowing you to download different types of instruments (Bass, Mandolin, Banjo, Violin, etc…), and different kinds of tuning. If you don’t already have one of these babies, I highly recommend that you get one. I think every musician on the planet should have one of these. 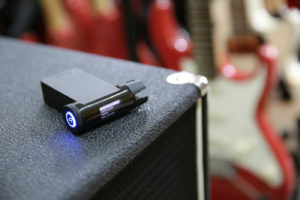 It will change your world of music in a quick and awesome way. GET YOURS TODAY!!! Thanks for reading. If you have any comments or would like to add your own review, please do so in the comment section below.